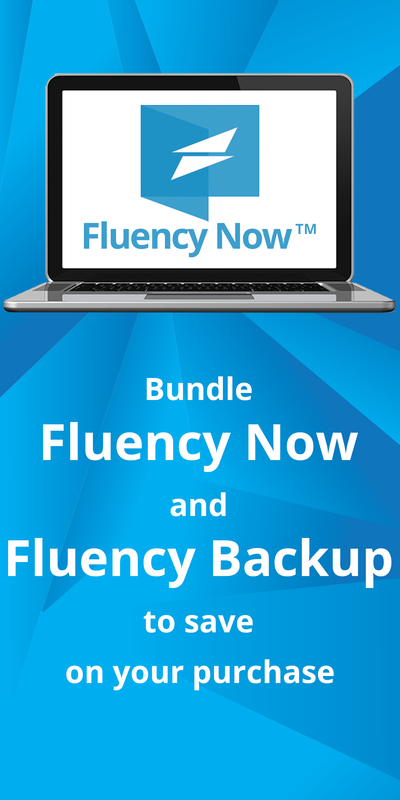 Fluency Now allows you to connect to a number of different machine translation providers. 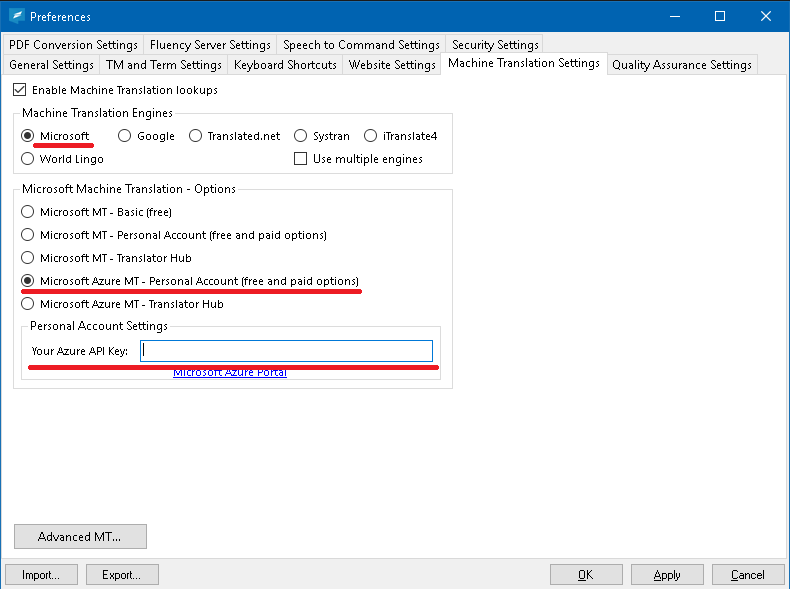 This guide will help walk you through the signup process with Microsoft's Azure MT system, which offers personal accounts of 2 million character translations per month absolutely free. First, you’ll need to sign into Microsoft’s Azure website. If you already have an account, you can sign in here. If you don’t have an account yet, you can sign up for one here. Click the Free Account link, then follow the on-screen steps to create your Azure account. 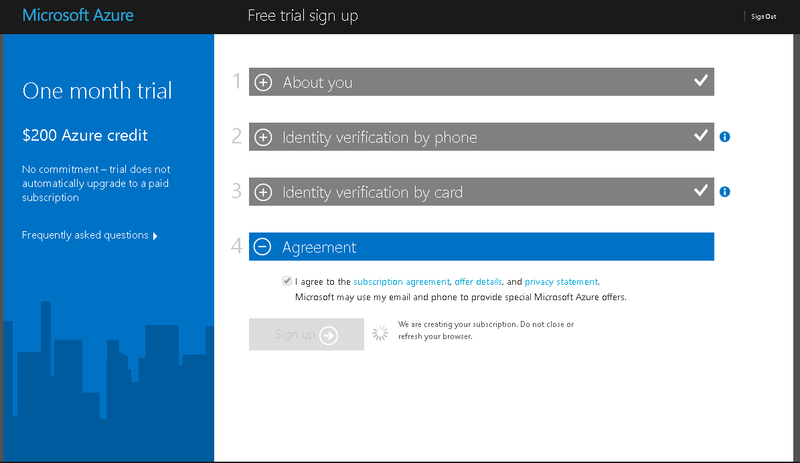 *Note – Microsoft requires telephone and credit/debit card verification for this step, however if you choose the free MT option as shown in the following steps, you will not be charged for anything. Once you’ve created your Azure account, you will be taken to your account dashboard. From here, click the +New button located in the menu on the right. Next, type ‘Translator’ into the search bar and click on ‘Translator Text API’ in the search suggestions. Now you’ll see a screen with text describing the Translator Text API service. Please read through this, then click the Create button. Fill out each field as described in the image below, then click Create. Make sure you select the Free option under Pricing Tier if you’d like to use their free MT service. Note: Be sure to select ‘Pay-As-You-Go’ in the Subscription field. If you select ‘Free Trial’, it will expire after 30 days and Machine Translation will stop working. Once your translator account has been created, click on All Resources and then on your subscription. Now you’ll see a Keys menu in the Resource Management section. 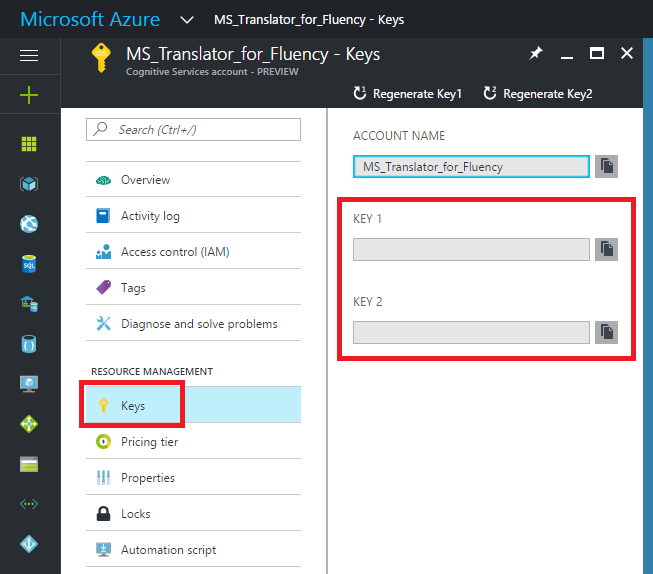 The Keys page will display two API keys, either of which can be used to connect Fluency Now to your Microsoft MT account. Finally, copy one of your API keys and paste it into Fluency Now under Tools > Preferences > Machine Translation Settings. Click on Microsoft > Microsoft Azure MT – Personal Account, then paste your key into the Your Azure API Key field.